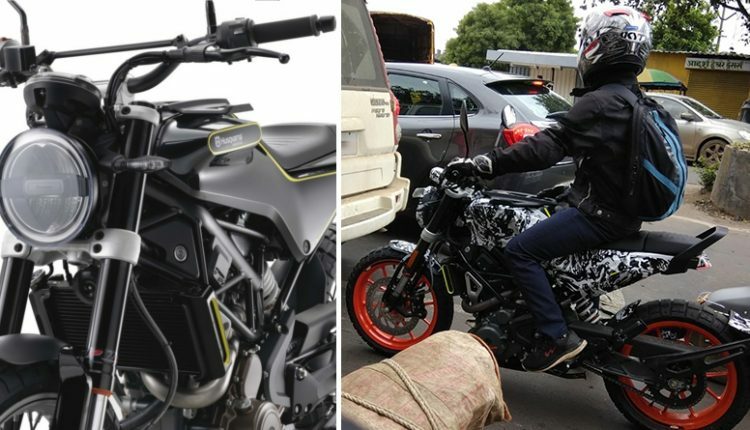 Husqvarna Svartpilen 401 was spied testing with a camouflaged body in India. The image clearly shows the use of KTM 390 Duke parts, further topped up with typical Husqvarna components like thick tread tires and independent tire hugger. Svartpilen comes with a chopped rear end, flat seating and flat fuel tank with more space for the rider and pillion in this compact setup. 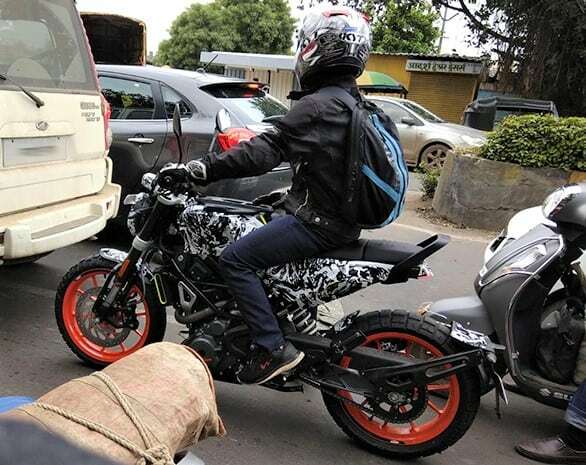 The rear can be seen with a grab rail, hinting that Bajaj Auto may have started using India specific accessories on the model. The flat handlebar and straight seating position is unique in comparison to both KTM 390 Duke and RC390. The spied motorcycle comes without a saree guard, clearing the fact that it still requires more accessories to be road legal in India. The alloy wheels are sourced from KTM bikes and same can be said for the front as well as rear suspension. Husqvarna Svartpilen 401 shares the frame with KTM bikes but for an exclusive look, uses an altered version for that chopped rear end look. The image was spied in Maharashtra, further cementing the fact that local production will start in the coming months. Svartpilen 401 is a scrambler by birth while Vitpilen comes as a cafe racer. KTM and Bajaj Auto are expected to bring this model with spoked rims for the Indian market. The final testing model may include those for better results. 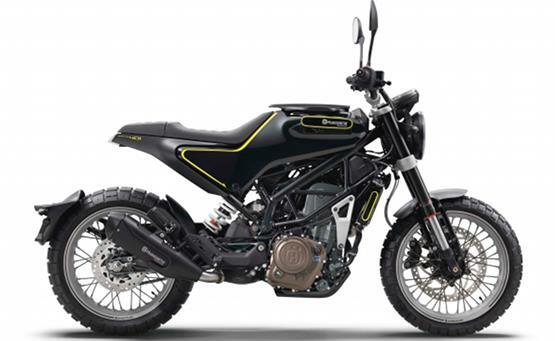 Husqvarna bikes in the 401 series use a 373cc, single cylinder engine from KTM Duke. The engine tune has not yet been released but one can expect these machines to be lighter in comparison. 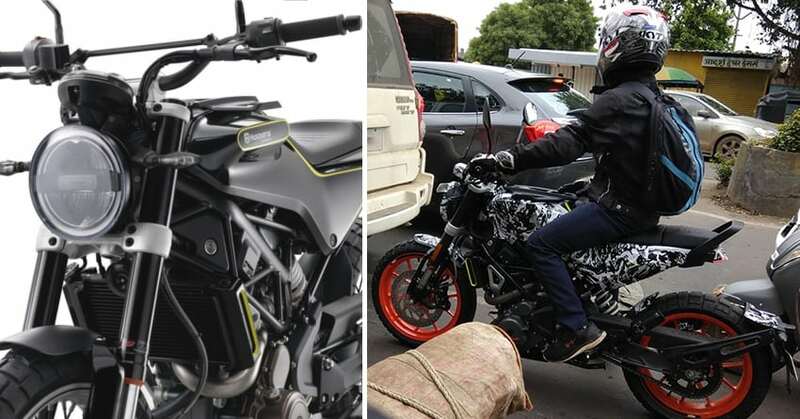 Svartpilen comes with a round front headlight and different exhaust design than regular KTM bikes. ABS will come as standard on the bike while one can expect same 320mm front and 230mm rear disc brake on the model.